Kathy Tidswell’s interest and attention to the details in nature are a continuing thread in her life. She graduated from the University of New Brunswick with a BSc in Honours Biology and worked as a fish health technician and later a forest genetics technician for Environment Canada. After ten years of marriage, she started a family and chose to stay home to raise her two children in a two hundred year old farmhouse. Around 1989, Kathy began her quilting career with traditional machine piecing and appliqué. In 1992 and 1993 she hand quilted two quilts, discovering that she really didn’t enjoy it. While making her beautiful small even stitches, she was wishing to be up in her sewing room! In 1991 an American guest teacher, Ann Boyce, introduced members of the Fredericton Quilters’ Guild to the world of using machines for everything from mock hand appliqué to machine quilting. With her creativity sparked, Kathy became hooked on the possibilities of machine work. About my work: I strive to recreate nature’s beauty realistically in my work. Often inspired by my own photographs, I paint a scene on fabric and bring it to life using thread, working with a domestic sewing machine. The needle becomes my paintbrush as I move the fabric freely. 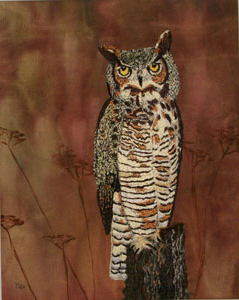 While my artistic medium is primarily thread, my painted fabric backgrounds support the production of landscapes and life-like three-dimensional images of birds, wildlife and portraits. My wish is to transport the viewer to a unique place, whether it is a forest stand, a beach delivering the glories of a morning sunrise, or a backyard hosting our joyous songbirds. 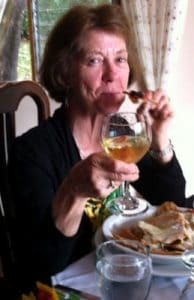 Over the next few years, she took drawing, water colour and oil painting lessons, took courses from a number of Canadian and American quilt teachers and machine embroidery specialists and collected an extensive library of quilting and machine embroidery technique books. Soaking in the technical and artistic information, she developed her own techniques for painting on fabric and using free motion machine embroidery to produce thread-painted works of art as well as quilted wall hangings and wearable art. The level of her work has been recognized by her peers and she became a juried member of the New Brunswick Crafts Council, selling her work at seasonal arts and craft markets. In 1999 Kathy entered the Canadian Quilters’ Association/Association canadienne de la courtepointe National Juried Show and won the Wineberry Award of Excellence for wearable art with her ‘Rose trapunto jacket’ inspired by a vase given to her by her husband more than 25 years before. This was a huge encouragement that she was on the right path in her work. Her Wearable Art was again accepted into the NJS in 2001 (‘Millenium Celebration’) , 2005 (‘Morning Solitude’) and 2012 (‘Night Watch). ‘Morning Solitude’, (2005) received Honourable Mention. Kathy also had wall quilts accepted into the 2005, 2006, 2013 and 2017 Grand National Juried Quilt Exhibitions, the 2008, 2015 and 2017 CQA/ACC National Juried Shows, the 2017 Contemporary Canadian Art Quilts and the 2018 SAQA ( Studio Arts Quilting Association ) Atlantic Canada show. 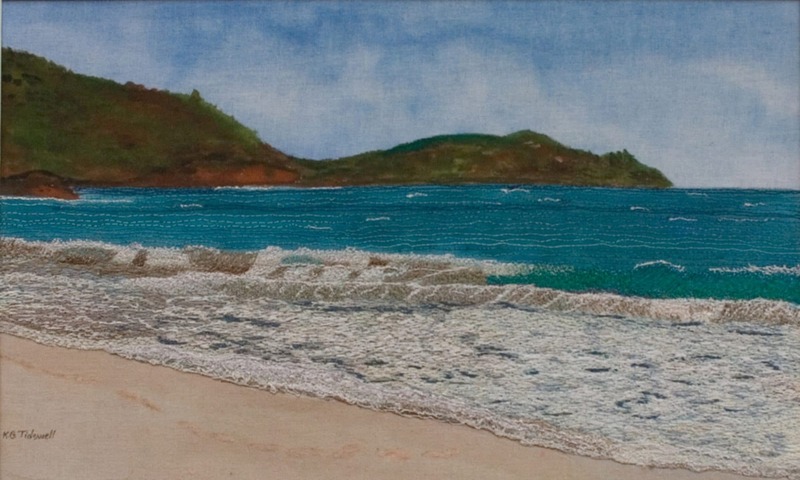 In 2010 and 2013 her thread painted pieces, Serenity and Splendour of the Caribbean, were accepted into Threadworks. Both pieces were chosen for the exhibitions that travel for 3 years throughout Ontario. In 2007 she received a New Brunswick Crafts Foundation Professional Development Award towards her study with Alison Holt in Oswestry, United Kingdom. Since 1993, Kathy has been sharing her knowledge and techniques through teaching for guilds, needlework festivals, fabric shops and sewing machine shops. She now divides her time between teaching across Canada (including five Quilt Canada’s( the biannual National Conference of the Canadian Quilters’ Association) , producing wall quilts and wearable art and creating and selling her thread-painted art work and 3-D thread appliqués. For a number of years Kathy created thread paintings spring to fall and worked on wall quilts for the remainder of the year. For the last couple of years, the thread-painted artworks, some of them commissioned works like ‘Doberman’, have monopolized her time. Photos of her work have been published nationally and internationally and her thread paintings reside across Canada, in the U.S and Great Britain, and as far away as Singapore. In 2009 she had a solo exhibition entitled Natures Thread and in January 2010 her work was chosen for a 4-person exhibition entitled This Land is Your Land. The highlight of her career has been receiving the Canadian Quilter’s Association/ACC 2005 Teacher of the Year Award. She enjoys working and teaching in both the quilting world and the art world. Please see Kathy’s Workshop pages for details. To see more samples of her works, please visit her online gallery.